Last night I slept restlessly. 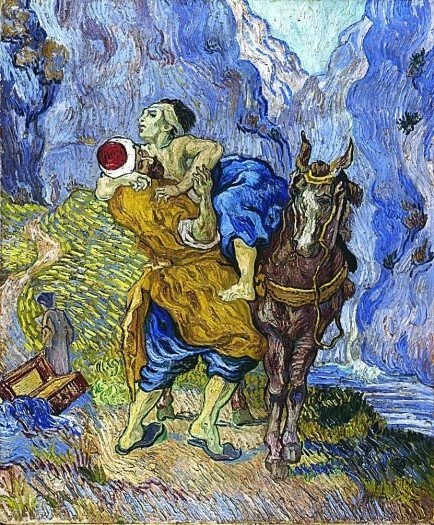 I kept dreaming of The Parable of the Good Samaritan. I don’t know why this is, I have not read it or heard it recently. But I do think there was a point to this dream – maybe it was sent to me by God. In reading through this parable, I painfully realize that I too often align myself, my thoughts and actions with the “expert in the law”, you know the lawyer guy. It seems that he is really suffering from the “I am a good person” mentality. He does all the right things, maybe says all the right words, knows all the right people and probably goes to church on Sunday’s, sings in the choir, attends a bible study for professional men and might even attend a prayer breakfast or two. He is SO righteous! Yet, clearly – he is also SO clueless. He may understand Jesus’ point of who is the “one who had mercy on him” but does he really ever go and do likewise? Does he see his own neighbour- the guy he doesn’t know AND the one he does know? Do I? How about you? The “faith” community can sometimes be the first to stick to the rules, pass by the neighbour in need, claim to have “donor fatigue.” Do we give mercy easily? I have been convicted of this very recently. There is someone in my life who has really angered me. They committed the “mortal sin” in my book. They messed with my kid. When this happens Momma Bear shows up and truly – the mortal sin part comes alive – as someone who messes with mine is closer to their own mortality…if you know what I mean ;). I may not have physically beat him like the robbers did of the travelling man, but mentally I sure did! Ya know, I am the first to say there is no such thing as a bad kid, just a kid who makes bad mistakes. But really? Aren’t we all “bad kids” at some time? We adults are often a reflection of our own upbringing and the adult who messed with my son is just a barely- grown up kid who is a reflection of his bad choices too. So God has gotten a hold of me and my heart and showed me HOW WRONG I am. I thought I was righteous in my anger…after all, he is my son. But I am also a woman who lives with the Holy Spirit. Jesus truly is my home boy, as He lives in me. Yet – my anger, my lack of mercy, my unwillingness to afford this person grace has infected me and made me like the “lawyer guy.” All puffed up in my righteousness and blinded by my fleshly and human instincts. But this does not leave room for God to work in the circumstance. For my son, for the person who got on my bad list, or for my rotten heart. When I am squeezed by life and circumstances, what am I allowing to ooze out? Grace? Mercy? NOPE – It is the infection of my ugly heart – which has been the case – and it spills into God’s kingdom; and my sphere of influence He has given me. ..And THIS is the problem with mercy. It is hard to live and really, inside of our own selves – impossible to give. In the book of James, Jesus’ brother writes to us and says to be DOERS of the Word (James 1:22-25) not just hearers… lest I deceive myself (and others). In the parable, the “man who was attacked by robbers” is akin to my son, who has been hurt by someone’s actions. The two people who passed by are those who cared more for themselves and their position to do anything substantive about it. But the Samaritan is supposed to be the person who comes to rescue; to put aside false ideals of what is right and wrong, and take on the process of assisting the man and see to his healing. I thought that was me, but alas – it was not. But it should be – in fact, as followers of Jesus Christ, we are all called to be the good Samaritan. Whether it is personal, e.g. someone has messed with you or yours and caused hurt – or whether it is witnessing someone else’s hurt – we have a job to do. Jesus didn’t excuse the behaviour of the robber or the two passersby. He just said, for as much as it is up to us we are to do what? So that is what I am doing. I am praying to God to release my heart from this anger. I am asking Him to show me His point of view in all of this – as He knew it was going to go this way as well. I am trying to see the lesson in it for me, for others, for my son (who by the way, is over it and maturely moved on). All in all, when I was in the midst of it – I could not see the proverbial forest for the trees. But now God has shown me in that perhaps He has a different plan. He has given me the opportunity to be pruned of my own shortcomings and He has seen to it that rather than condemn the person who had the impunity to awake Momma Bear, that I condemn the actions instead. Now I am praying about it and willing to see what my part in it is, and who knows, I may even send a copy of this blog to that person. What I do know is this – If I allow myself to “Love the Lord MY God with all MY heart, and with all MY soul and with all MY strength and with all MY mind…then the “Love your neighbour as yourself” part is going to happen…because God even gives mercy to Momma Bears…and maybe tonight…I will sleep restfully, knowing that I am now working in agreement with God, and He has taught me ONE MORE TIME – how to GO…and show mercy. God's View vs. World View, Life lessons, Life Stories, Parenting God's Way, Slippery Slope, Teenagers, What Is Truth?